Like many of you, the events of February 14, 2018, have been at the forefront of our minds for the past week. A short drive from our office would land you in the midst of the mourning and strength of the Marjory Stoneman Douglas High School community. In no uncertain terms, this hits close to home. On Wednesday, we watched as CNN hosted a town hall event, where students, community members, and politicians came together to discuss the tragedy. Within the first minute of one opening statement, we were disappointed to hear words like “nuts,” “mentally insane,” and “crazy” used. These terms were repeated throughout the rest of the segment. We don’t know what those words meant to the person who called out, but we know what those words mean to us, which is why we want to echo that refrain here. Stop equating emotional or psychological pain with evil. Stop portraying mental illness as some kind of scapegoat. That does nothing but prevent an estimated 56% of adults and 80% of children with mental health issues from seeking the help they deserve. Leaning on “crazy” in the wake of tragedies like this one dismisses what we have learned to be true. According to the U.S. Department of Health & Human Services, fewer than 5% of violent acts can be attributed to people with a serious mental illness. Their research also highlights that people with severe mental illness are 10 times more likely to be victims of violence than the general population. By relying on a stigmatized word, we risk missing opportunities to connect the most vulnerable among us to sources of safety, of hope, and of help. For many, maybe even for you, this past week and the conversations that have followed have awakened a sense of fear and disconnect, a feeling that you too may be viewed differently now. You deserve to be called by your name, not by your diagnosis or your pain. Right now, we’re working to visit every high school in Brevard County, where we’re based. Our goal is to bring our message of hope and help to the 22,885 high school students who are growing up in the place we call home. We don’t know what the coming days, weeks, and months will bring. What we do know is that we leave those high schools feeling hopeful. Students like these, like the ones at Marjory Stoneman Douglas High School, and like those all over the country are speaking out and asking for what they need. Through their words and actions, they’re making the world a better, safer place. So, in the coming days, weeks, and months, we’ll follow their lead. We’ll encourage their voices. And we’ll continue to carry out our mission of presenting hope and finding help for those struggling with mental illness. To contribute to the Stoneman Douglas Victims Fund, click here. You can find additional ways to support those affected by the tragedy here. If you are struggling in the wake of these events, we encourage you to reach out for help. To start, you can visit our list of resources here. You can also text TWLOHA to 741741 to get connected with a crisis counselor for free 24/7. This article also includes helpful tips on how to manage distress in the aftermath of a shooting. Where do you brilliant people come from!? You are amazing! I agree with you. We each deserve to feel safe and to be called by our given names (or our preferred nicknames) — and not referred to by careless words, slurs or mean-spirited jokes. I can’t thank you enough for this post. I am one of the 56% of adults with mental illness who lost hope and delayed seeking help FOR YEARS due to ignorance, stigma and bullying . 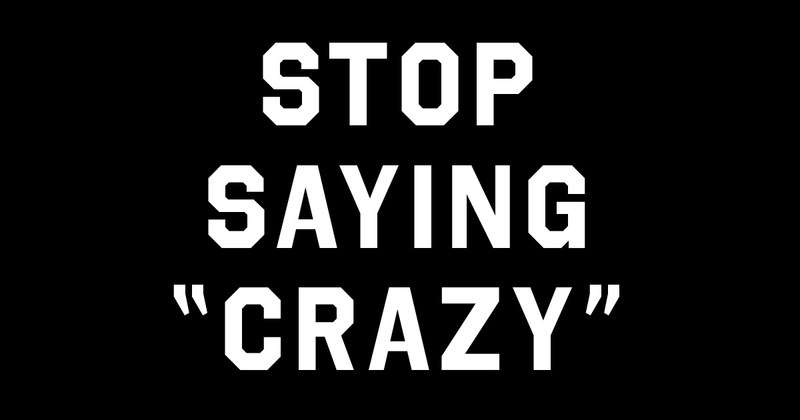 When we “stop saying crazy,” we no longer view people as useless, hopeless, helpless or worthless — and we begin to see them as worth our time, effort and energy. Everyone is beautiful and valuable. Everyone has a purpose in life. Everyone has something to give. WE ALL MATTER! I realize that I need (and want) to personalize the last half of my comment. . . When I “stop saying crazy,” I no longer view myself as useless, hopeless, helpless or worthless — and I begin to see myself as worthy of time, effort and energy. I am beautiful and valuable. I have a purpose in life. I have love to give. I MATTER! THANK YOU!! I’m so glad I found To Write Love On Her Arms and this blog post is exactly what I’ve been wanting to say but haven’t been able to put into words.